EMAYLUM ITALIA s.r.l. is a company dedicated to the production of enamels and vitrifiable products for metal, glass and ceramics. Our company has its origins in the Fifties in Segrate (MI) with KAREL, where they already produced their own frits in melting furnaces, and which became over time Blythe Karel, later Cookson Matthey and finally Johnson Matthey. The latter company sold its porcelain enamel branch to the current ownership in 1999, initially as part of a partnership with multinational society Wendel Email GmbH. In 2017, after acquiring all the society, our company has been renamed, continuing its activities in a completely autonomous way, but with the dedication we are well-known for, and with a know-how that distinguishes us in the European landscape. 14 years in Emails Bayer in Filago (later Pemco), 12 years in Johnson Matthey and 18 more years with Wendel Email Germany, with a lot of newly developed products, show the solid know-how of the current technical-commercial management. Our company is a leader in the innovation, research, assistance and commerce of not only traditional but also special enamels, those that other producers do not make or that do not exist on the market. All our products are in full agreement with the RoHS and REACH directives and, for this reason, they are completely free of lead, nickel and any other substance dangerous for health or environment. All this is what earned us appreciation and esteem for over 20 years from the most important customers, both producers and contractors. Ask for the most unthinkable product for your success, if it does not exist yet, and we will invent it for you. Our company develops and sells porcelain enamels, to many national and multinational companies, such as Electrolux. We also sell to customers producing chemical reactors, resistors and panels for heat exchangers. We are leaders in production of enamels for pipes. Our society made its name also in the field of products for glass, thanks to an offer of special products developed in our laboratories, with customers such as Saint Gobain Italia, Ilva Glass, Valentini and several glassmaking factories. Attilio Monzio Compagnoni is the founder and current sole administrator of Emaylum Italia srl. He was born in Bergamo (Italy) in 1947 and graduated as an expert in industrial plant and machinery. He was initially in charge of maintenance, development and construction of manufacturing plants for enamel, frits and pigments in a German multinational company. Two decades later, he was employed in an English multinational company as factory manager and was responsible for enamel production for 12 years. During this period, he developed and launched a full range of enamels for metal and niche products for glass and ceramics. At the end of this experience, in 1999, he became an entrepeneur and founded a new factory together with a German multinational corporation; the new company has made a name for itself both in Italy and abroad as a leader in specialized non-standard enamels, both for aesthetic-perspective and technical characteristics. Since 2017 Attilio Compagnoni acquires all the shares, becoming the sole administrator of the new company Emaylum Italia srl. Thanks to his long experience in the field of enamel research, he has spoken at many national and international Congresses. Some of his articles have been published in the magazine “Smalto Porcellanato” of C.I.S.P. and he co-authored the book “Enamel and Design. 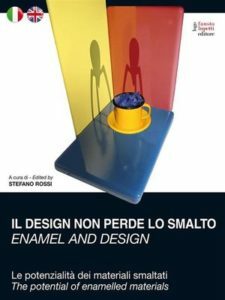 The potential of enamelled materials“ with Prof. Stefano Rossi from the University of Trent, published by Fausto Lupetti Editore. Enamel and Design. The potential of enamelled materials in design applications. Research paper for the 22nd International Enamellers Institute Congress in Cologne, Germany (2012). Reduction or elimination of vanadium in enamel for aluminium. Research paper for the 21st International Enamellers Institute Congress in Shanghai, China (2008). The enamelling of aluminium with a high content of magnesium. Research paper for the 20th International Enamellers Institute Congress in Istanbul, Turkey (2005).